Screeb: What's confusing? The statement from Orcon claims that the P2P shaping was "unnoticeable" when it clearly wasn't. That it's no longer shaped is irrelevant. When it was shaped, it was extremely noticeable, contrary to the claim in the statement. Most ISP's who offer unlimited type plans use this to protect their network, however in reality its never been used as 1 person on 1 connection should never be able to congest the entire network. While I recognise there is most likely some reason for this passed down from a old policy decision, times have moved on! As should policy. why not just use dynamic dns? I have DD-WRT setup to automatically update my IP whenever my WAN interface is connected. OpenWRT is very capable of doing this also for a lot of providers (and of course stock firmware). Personally, the idea of a static IP isn't much of a problem anymore for me. Though it would depend what you were doing of course... (I mainly do RDP, VPN, Web Server), but if you were running a mailserver, maybe not so great? How about streaming services on Orcon unlimited? I would like to switch to unlimited, but fearing network performance would be a drop and having no way coming back to the same plan deters the decision.. I'm still on the 200GB and I seem to recall that unlimited users shares the same pool of resources, is that still the case? alliao: How about streaming services on Orcon unlimited? I would like to switch to unlimited, but fearing network performance would be a drop and having no way coming back to the same plan deters the decision..
You can expect the same performance on any of our plans, NONE have traffic shaping. Times have indeed moved on... IPv4 addresses are now a scarce resource. Not sure why you'd expect to get a dedicated one on a $99 consumer connection? It's not like Orcon can go fetch some more when they run out. I have a static IP with Orcon on a consumer connection that I pay for right now. So my expectation is justifiable. Checking the plans would have given you this information: http://www.orcon.net.nz/external/genius/geniusfibresep12.php. There is an option for static IP down the bottom. I have it on good authority there is currently no difference in how traffic is treated between the older plans & the unlimited plan. I used to be on the old 1TB plan & have changed to the standard unlimited. With the exception of the now-dynamic IP, we have not noticed any drop in performance. Thanks FireEngine, danielsiva and friendlymonkey! 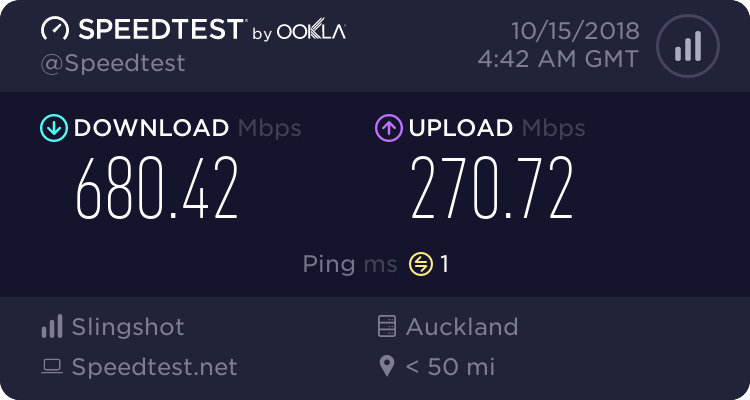 I've ordered the VDSL unlimited last night and the package arrived today. Talk about speedy service. I did consider BigPipe, but turns out it's just another Telecom subsidiary which curiously doesn't include VOIP options. So sticking with Orcon it is! Cheers everyone.